The model features a fully articulated skeleton. Materials were chosen to best simulate bones and skin while also being visible on an x-ray. VSI has employed a soft, silicone skin that surrounds the tendons and ligaments, which can be felt through palpation. The palpable joints include the intercarpal, radiocarpal, fetlock and coffin joints. The full superficial and deep flexor tendon unit are readily palpable along the back of the cannon bone and on toward their insertions. Palpation of the suspensory ligaments and the palpable landmarks of the pastern are also featured. 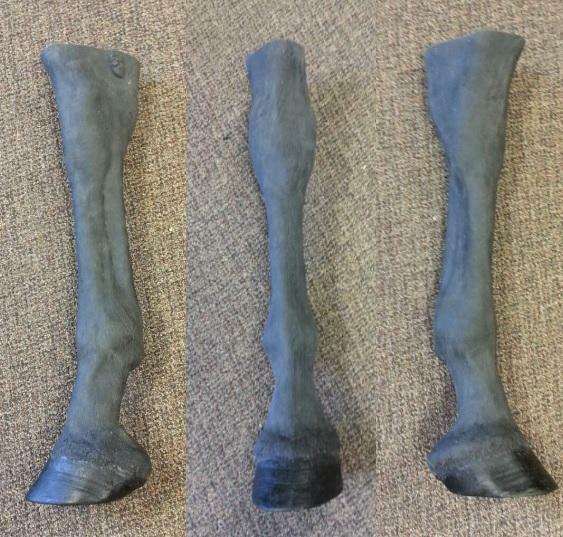 The limb can be attached to Sask PolyTech’s custom VSI Equine Palpation Colic Model by screwing the threaded rod on the limb into the full horse.